Released by AppChocolate, 25 Days of Christmas – Holiday Advent Calendar 2015 is a Christmas advent calendar for your iPhone. With charming illustrations of a snow-covered town and music fitting for the season, 25 Days of Christmas is a nice way for kids to count down the days until Christmas. 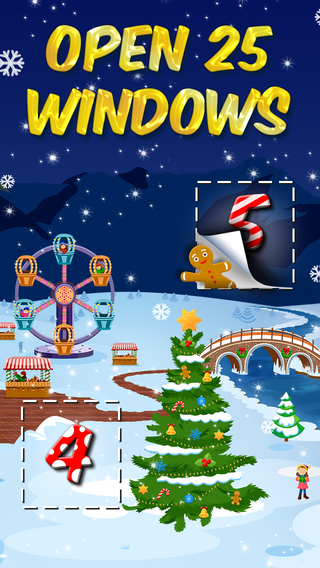 The visuals are simple but engaging and you can scroll through the month by tapping and dragging or swiping to move through the town towards December 25 – and Santa Claus! Like any good advent calendar, you’re not allowed to open the doors until that day arrives. When you tap on a number, you’re taken to a quick little mini-game – decorate a tree, smash a cookie, throw snowballs at elves and more. The faster you are, the more stars you can earn. After completing the game, you’re able to ‘unwrap’ a gift – which include free downloads of iOS games. 25 Days of Christmas has a leaderboard for the mini-game times, so you can see how your stats compare to others as well as achievements for completing certain tasks within the game. 25 Days of Christmas – Holiday Advent Calendar 2015 for iOS requires iOS 7.0 or later. Compatible with iPhone, iPad, and iPod touch.